​​​Sunday Worship Services are at 11 a.m.
​Christian Education classes for Adults, Children & Youth will run from September through June at 9:30 a.m.
Vital and subtle lessons of the Christian faith are conveyed in the rituals, practices and gestures of the church. Their power lies in being ‘embodied’ – in the church’s refusal to separate mind, heart and body. Indeed, the practices of the church function as a prism, offering Christians a particular lens - the imagination of Christ - through which to view the world. How rituals & practices function in the life of faith and of the church. How ‘ordinary things’ become ‘extraordinary’ for our life of faith. How baptism and church membership reflect vital covenants – even amidst significantly changing times and understandings. Home Street’s present understandings and practice. What we do - and what we mean by these rituals. How embodied rituals function to shape our understanding and practice of community and faith identity. How personal stories of communion, baptism and church membership can inspire and inform our faith. Sunday School is an important component of the intergenerational life and spiritual growth of Home Street Mennonite Church. Sunday School classes are available for children and youth, ages 3 to 18. Children under the age of three are welcome to accompany their parents to the adult education class. ​Classes run from early September to early June. 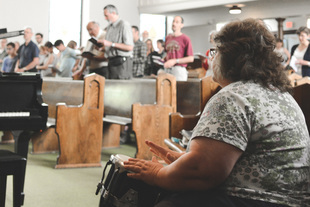 They meet Sunday mornings, from 9:30 to 10:45 a.m., starting with intergenerational singing in the basement fellowship hall. On some Sundays, there are large group learning events that focus on special topics and involve all ages. ​For more information call the church office. We welcome your family to our Sunday school!